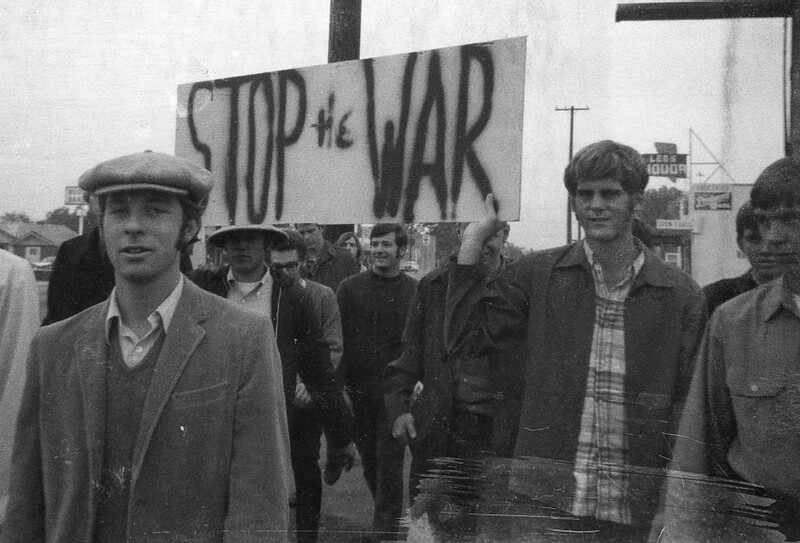 My father (left) leads the Fresno Pacific Peace Club at the citywide Moratorium Day protest of the Vietnam War on October 15, 1969. Students walked 4 miles from then-Fresno Pacific College (now Fresno Pacific University) down Maple Ave to Kings Canyon Rd, past the Fresno Fairgrounds, then along Cedar Ave to Courthouse Park in downtown Fresno. Details thanks to Paula Lloyd of the Fresno Bee. Photo from the October edition of Pacific College Viking newspaper. It has been four months since I wrote my last From the Editor. After two and a half years, I stepped down as editor of Community Alliance newspaper. It is my pleasure to pass the reins to Elsa Mejía on her first official month as editor. I know she will do a great job. As for me, I will continue to do journalism and am in the early stages of research for a book I hope to publish about the history of activism in Fresno. It will be a long time before the book is finished and I have only begun to shape its parameters but I know that I want it to be as comprehensive as possible. In the weeks, months, and probably years to come, I will be reaching out to people to contribute to it. The reason I decided to do this is that no one else has and I think our community deserves a record of this history. It should make us proud of what has been accomplished and spur us on to do more. My starting point is personal. In the late 1960s to the early 1970s, my dad was the president of the peace club at Fresno Pacific College, now called Fresno Pacific University. In October 1969, he led the group in a protest against the Vietnam War and wrote a corresponding article that was published on the front page of the Viking, then the name of the college newspaper. I learned about my father’s article from Tom Frantz, a friend of my dad, a former colleague of mine at Community Alliance, and the blond young man holding the sign in the photo above. Poring through old newspapers in Pacific’s library archives has allowed me to be a fly on the wall of history. So far I have made it to the early 1980s, not long after I was born. Due to an agricultural landscape that feeds the country and its reputation as the most politically conservative region of the state, California’s Central San Joaquin Valley is sometimes called “California’s Heartland” or the “Midwest of California.” This stereotype ignores our vibrant and diverse communities and erases the many people of color (true of the Midwest, too). The full story is far more complex, with leftist actions throughout our history from labor organizing to immigrant rights activism to clean air and water advocacy to protests of police brutality. Historically, these movements have been suppressed and marginalized here like everywhere else. Recently, Fresno’s despicable history of redlining, inequality, and racism in schools, neighborhoods, and policing has rightly gotten national attention. But rather than some ugly unicorn, Fresno is really a microcosm of a nation with these problems at its heart. Having lived and studied history throughout the state I can attest that virtually no city or town in California is free from any of these atrocities in the past or present. In the '60s and ‘70s, the conversation in Fresno Pacific College’s newspaper often revolved around civil and human rights, racism and imperialism. 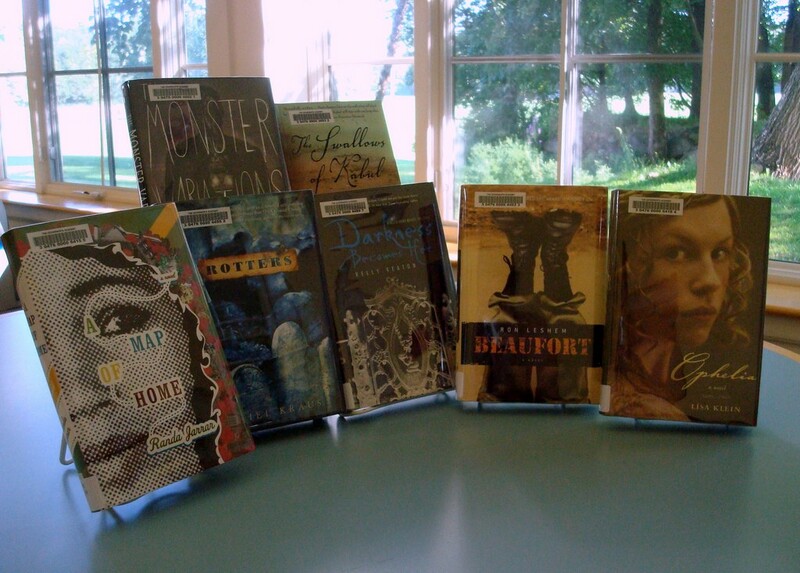 The way those topics were generally framed showed that while limited by their own primarily white heterosexual male experiences, these student writers had read the social criticism of people like James Baldwin and Malcolm X and taken to heart the lived experiences of people of color. They had at least a basic grasp of the concepts of race, power, and privilege. With each year and each turn of the Viking’s page, this robust social criticism waned. As the Reagan Era of my childhood took hold, a lot of activism here and around the country faded away. Cynicism about the power of ordinary people to effect real change had settled in. By then, my dad had become jaded that anti-war activism had played any real part in ending the Vietnam War. Even some who had been denounced as radicals and agitators themselves when they were young were starting to fear anyone who expressed outrage with continued injustice. 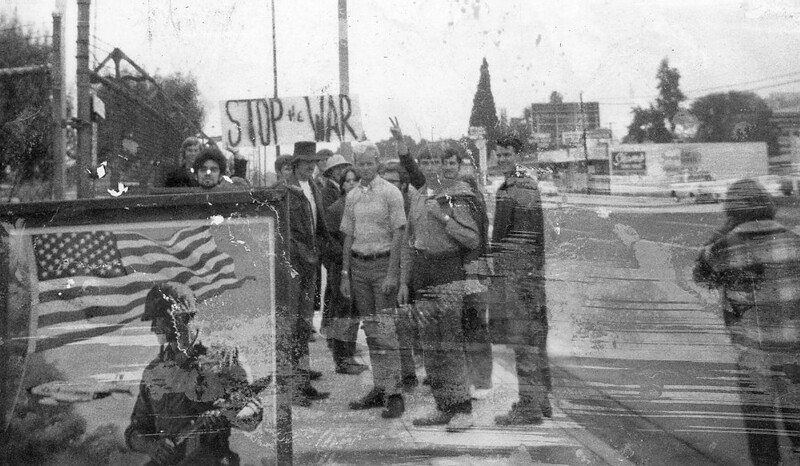 Fresno Pacific Peace Club marching in Southeast Fresno at the October 15, 1969, Vietnam War protest. Photo from the October 1969 edition of Pacific College Viking newspaper. Rather than the fear of the civil rights movement that was pervasive in the ’50s and ’60s, a dismissiveness had taken hold. The thinking went that given a bit more time, society would have given those rights anyway. This is a wrongheaded corollary to the wildly erroneous argument that “slavery would have died out on its own because it was no longer profitable.” Slavery can never be unprofitable and the powerful never give up power without a fight. Children my age were led to believe that Martin Luther King Jr. had always been embraced by mainstream white society outside the South, not branded a troublemaker. (“They love you when you’re dead.”) Anyone who said we still had work to do at the turn of the 21st century was going too far and exemplified the bad kind of activist we had to protect society from. Moral ambivalence about racism, war and the fundamental rights of human beings hung over my generation as our nation slid into military engagements like a hot knife through butter. Understanding of power and privilege dwindled as false narratives about reverse racism, the sexism of feminism, the inherent threat of people of color, the Islamic destruction of the Western world, the dangers of political correctness and the deserving versus the undeserving poor took hold in the '80s and '90s. No matter how liberal your upbringing, it was hard to completely repel these insidious notions as they infected the public consciousness. Without the experience or education to critique them, young people especially absorbed them as truth. Beyond being parroted by politicians and partisan pundits, these ideas were given credence in academic journals and reported by journalists as if they could be facts. In fact, these arguments became so widely accepted and so rarely challenged that they often still creep in. While many Americans internalized at least parts of these lies as truths, activism that pushed back on them never truly died out and thanks to young people today it has resurged. Mired in the cesspool of the Trump Era many have forgotten that while his rhetoric and actions make up some of the most extreme examples, he is not the first president in the last 40 years to make racist statements or to enact bigoted policies. Proving the forgetting curve, some on the left have even become nostalgic for George W. Bush. In addition to the Reagans and the Clintons, the Bushes played their part in shaping the political and worldviews of a generation of Americans, especially white Americans. I was 13 in May 1991 when then-President George H.W. Bush initiated the contemporary usage of “political correctness.” He emphasized it in his remarks to the University of Michigan Commencement Ceremony in Ann Arbor, Mich. The cognitive dissonance of accusing people of discrimination and injustice for calling out discrimination and injustice should always have been apparent. Since it came from the president of the United States, and especially from one deemed moderate or centrist, this ridiculous argument gained widespread validation. This becomes more insidious when you consider the impact on communities of color and all marginalized groups in the U.S. and abroad due to policies George H.W. Bush supported as vice president, those of his own presidency, and those of his son. Accusing activists of political correctness has been a favorite past time of conservatives (and some liberals) for decades and a convenient “Get Out of Jail Free” card to get away with racism. When you get caught saying or doing something racist, just throw it back and claim that you are in fact the victim. It was a brilliant sleight of hand by George H.W. Bush. Barbara Bush was known for her “candor”, her “frankness”, her “tell-it-like-it-is-ness.” On virtually every mainstream news outlet in the days following her recent death, journalist after pundit after historian waxed on and on about her supposed virtues. To anyone who remembered and cared about the offensive content of some of this frankness, it was nauseating. The problem is many on the right and the left had forgotten or never paid attention to it in the first place. Most of the evacuees had lost their homes, their schools, their loved ones, their whole lives in the hurricane. Many were never able to return to those lives. They had waited an appalling length of time to be rescued and then packed into a stadium for days without proper supplies of food or water or adequate sleeping arrangements. The neighborhoods most affected were predominantly African American. In response, Mrs. Bush spun this gossamer veiled racism, with its insinuation that these “underprivileged” people were opportunists who somehow benefited from the disaster and should kiss the ground for whatever crumbs were thrown their way. 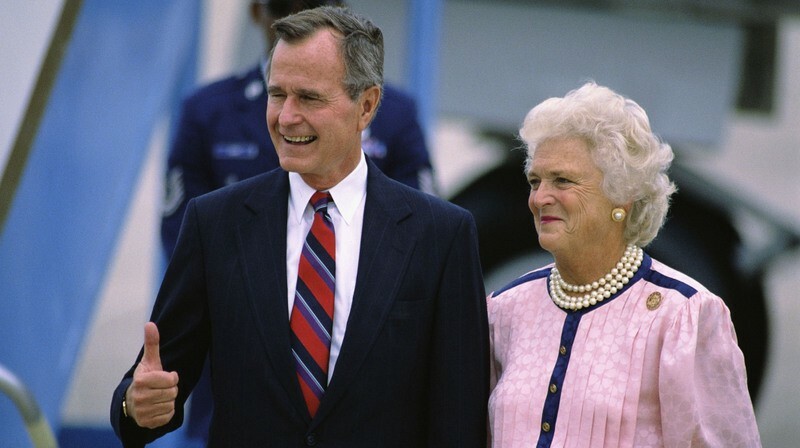 Despite how the majority of White America wants to remember Barbara Bush, people of color have not forgotten her comments nor the policies of her son and husband. A young Arab woman born in Chicago, raised in Kuwait and Egypt, who returned to the U.S. in 1991 at the age of 13 certainly was paying attention. That’s right, while hundreds of thousands of Arabs, most of them civilians, were being killed by U.S. military forces in the Middle East, Mrs. Bush complained of hearing about the realities of the bloodshed. Protecting her “beautiful mind” from confronting the harsh truth about war was of greater importance to her than this vicious loss of life. Their deaths were apparently irrelevant to the mother of the man who had invaded these countries under false pretenses and unleashed massive violence on them. These comments by a former first lady were insensitive, entitled, and willfully ignorant. Not surprisingly, Jarrar did not stand by while the former first lady worship droned on. She tweeted that Mrs. Bush had been an “amazing racist.” With this truth, she broke the Internet. People who had not thought about Barbara Bush in decades were now suddenly overcome with grief. They rushed to her defense because she was an old lady who had just died, an old lady who had always reminded them of their own grandmothers. Given their lack of sadness and outrage at civilians violently killed in U.S. wars, these mourners never saw their grandmothers in those elderly Iraqi and Afghan women who died. Jarrar’s tweets became much more than a local story, it went viral around the world very quickly. Fresno academics and newspapers were bombarded with vitriolic commentary. A good deal of that came from locals but a lot of it came from people in the Southeast and Midwest. Jarrar received a barrage of death threats online as outspoken women often do, especially women of color. She was forced to make her social media accounts private for this reason. Fortunately for her safety, she had already been on sabbatical out of the country. These attacks were picked up by everyone from FOX News to regional self-described alt right newspapers. Only a few days ago, a Dayton, Ohio paper known as “an alternative newspaper emphasizing arts, culture, entertainment and a little politics” published an op-ed about her titled “If You Don’t Have Anything Nice to Say…” that included an offensively drawn cartoon of Jarrar. 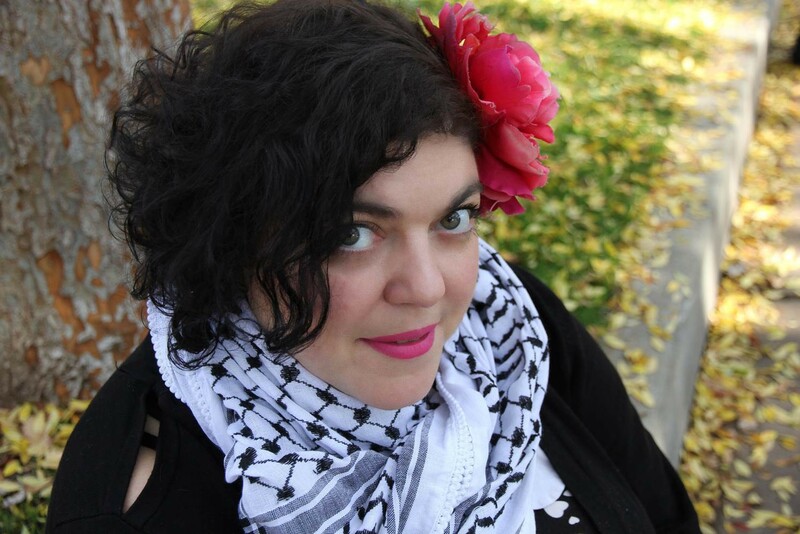 Fresno State was threatened with heinous acts if they did not fire her. Many who did not go to this extreme still called her words deplorable and inexcusable. I saw a lot of clutching of pearls even by some on the left, including those from more politically left-leaning areas than the Central Valley. These people insisted, eerily like the Dayton paper, that if you can’t say anything nice, you shouldn’t say anything at all, especially when someone has just died. I lost my father to pancreatic cancer when I was 26. I understand firsthand the impulse for sensitivity to not speak ill of the dead while their loved ones are still mourning. My issue is that that same courtesy is rarely extended to those like Jarrar, people from countries and communities that have been destroyed by U.S. military wars, wars on gangs, and wars on drugs. So many innocent lives are callously taken with few tears shed by White America for those lives lost and loved ones left behind. People of color are often expected to sorrow silently, all while being called terrorists, thugs, and welfare queens. When they fight back by denouncing the racism of those attacks, they are railed against as the true source of the problem. No, they are not. That is the same false narrative that George H.W. Bush birthed into prominence the year Jarrar came to the U.S. Anyone who claims to care about the most vulnerable, must focus on improving the conditions of the powerless and holding the powerful to account. In addition to those with the highest status, we also must reflect honestly on those who have power in our personal lives. As a nation, as communities, and as individuals, we have to be careful how we eulogize those we love and admire. My father was not without faults. While he had lots of criticism for George W. Bush, he had a strange affinity for his father. He saw him as the “kinder, gentler” conservative that people want to remember now. Like too many, he had selective memory. My dad thought of George H.W. Bush favorably largely in contrast to his son, much like people today comparing him to Trump. It is dangerous to forget brutality by anyone. I have not met her, but Jarrar and I are the same age. We were shaped by many of the same pop culture phenomena and geopolitical events, but I have had the privilege of experiencing them while white. Those of us who have that privilege must stand up to these false narratives and stop rushing to protect problematic figures or put them on pedestals. We need to truly hear the voices and learn from the work of people of color who are the experts on these matters because we are not. I suggest starting with Randa Jarrar. Author’s Note Dec. 27, 2018. This article has been edited to add content and links to articles about George H.W. Bush’s policies that were written after his death in November 2018.